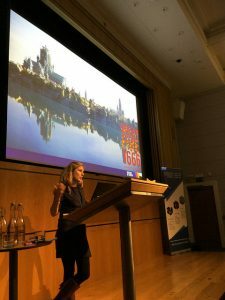 Even though ‘digital’ is not in my job title as a museum documentation assistant, I really wanted to attend the Museums Computer Group Museums+Tech conference. My interest was sparked earlier in the year when I attended a seminar on digitisation which whet my appetite for the diverse range of applications of technology in all aspects of museum work. I also feel that the digital world and technology is becoming increasingly important in society and will become a part of every job description, so felt it would be great for my own professional development. Throughout the day I was inspired, developing ideas which I felt I could take back to my own workplace and utilise in upcoming projects and share with colleagues. I think the key message I took home, which all the speakers touched on, was to take a user-focused approach based on demand. 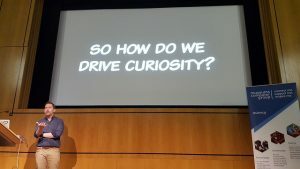 The opening keynote speaker, Sebastien Deterding, delivered a light but insightful talk on ‘Designing for Curiosity’ which explored how to direct visitors to digital content through creating curiosity – a method which could be applied to physical museum exhibition spaces too. His comparison to puzzle design through gradually revealing information as opposed to setting up a quiz provided an interesting perspective and a different approach. Elaine MacIntyre from National Museums of Scotland, provided an interesting case study showing how they improved their website with their new ‘explore’ section. They adopted a user-focused approach, researching current users and their needs and analysing where their site was falling short. They used this data to develop their new site which has increased users and dwell time on their collections site. The Museum of London ‘Fire! Fire!’ project, presented by Rhiannon Looseley, demonstrated how much can be achieved within a tight timeframe. The objective was to create a one-stop resource for anyone wanting to learn about the Fire of London. This included developing a new website, working with partner institutions to put collections relating to the Fire of London on the site. In addition, they also developed a Fire of London Minecraft world. Both aspects of the project highlighted challenges showing the need to be user-focused, strategic and realistic. The take home message: having it done is better than perfect. You can always add to it later. Another highlight of the day was an enthusiastic and inspirational talk by Lucy Moore of Leeds Museums about creating an online interactive on a World War One theme. The project demonstrates how a museum experience can be taken into the digital sphere. Collections were at the core of the project, highlighting medals which are usually in store and not regularly accessible to the public. The resource drew upon the diversity of stories and experiences associated with these objects as well as educating about the physicality of the object. This in turn inspired users, where they could create their own digital medals and submit them to the museum. This project succeeded in evoking an emotional connection between individuals, objects and the past. Even more impressively, it evoked this in audiences thousands of miles away on the other side of the globe, showing the importance of digital in sharing our collections with the world. The day closed with innovations at The Barnes Foundation. Shelley Bernstein explored issues faced on the ground in the museum, including access and diversity as well as practical issues (such as finding the front door!). This led to an exploration of audio guides and whether they were fulfilling visitor needs. This research showed a preference for short-form over long-form content, stimulating interactions in the gallery spaces and saving information for later. So watch this space for their latest project! The closing remarks of the day provided a good summary for the day: we should not do something for its own sake, but always do it to improve user experience. Subscribe to our email newsletter and be the first to find out about MCG's annual conference and other events.